There will be no HERO repeal referendum on the ballot this year, but depending on how the trial (and likely appeal) goes, there could be one next year. Opponents of Houston’s equal rights ordinance dropped their request for a temporary injunction Friday that could have triggered a process to set a repeal referendum this November. That means their lawsuit will not be heard until January 2015. State District Judge Robert Schaffer early in the Friday injunction hearing questioned why the plaintiffs were seeking the same outcome via injunction as they are seeking in the lawsuit. “If I grant the relief you’re asking for, isn’t that granting you everything you’re asking for in your petition?” Schaffer asked. The announcement that the injunction request would be dropped came after Schaffer consulted with both parties in his chambers. Also Friday, Houston’s 14th Court of Appeals denied a separate request from opponents to force the city secretary to certify the signatures on their petition and trigger a referendum. A three-judge panel ruled that the emergency writ of mandamus plaintiffs sought would have the same result as a favorable ruling in their pending lawsuit that went before Schaffer’s court Friday. The plaintiffs, the judges wrote, could appeal after a ruling comes down at the trial court level. See here, here, and here for the background. What Judge Shaffer was saying was that in the lawsuit the plaintiffs asked that the petitions be declared to be valid as part of their request for immediate injunctive relief, which is to say they were asking to be declared the winner before a trial took place. Now we’ll have that trial, and hopefully settle the issue once and for all. 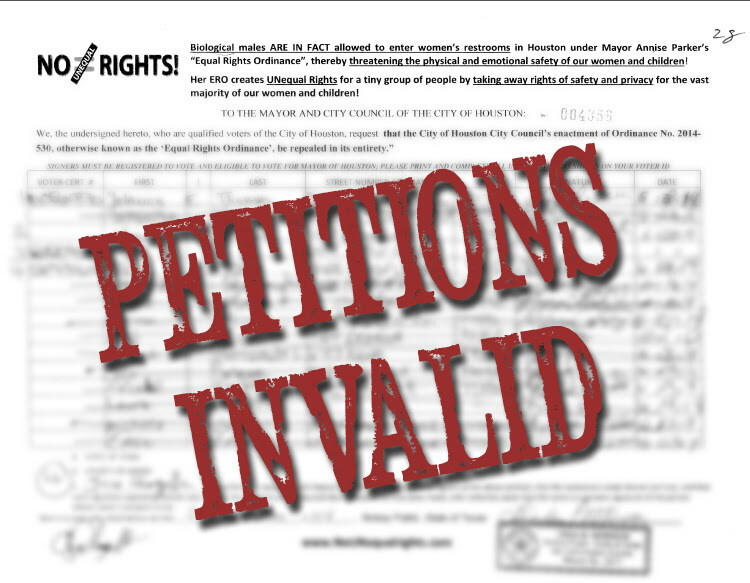 In the meantime, the city has agreed to continue not enforcing the ordinance pending the outcome of the trial. Mark your calendars for January 15. Jerad Najvar, who had previously made the case for the plaintiffs, Hair Balls, Lone Star Q, and LGBTQ Nation have more. Clearly, the risks inherent in treating gay people like straight people are just too high.